In chapter 1, we explained about the meaning of interior design and the fundamental key points that are taking care in consideration in every design of space: Is it practical? Does it make me feel good? What does it say about me? This chapter we will start covering the elements of design. The elements of design are the characteristics that eventually give the final look and feel for the design of your room. Each element has it’s own effect and all elements together are creating the ‘big picture’ of your space/room design. Altering one element can change entirely the the look and feel of your design, and make a whole new interpretation to your room. This chapter we will elaborate about 3 major elements in interior design: Space, Line and Color. Space is defined as the three dimensional expanse that we fill pieces of furniture and decor (objects) with. It has width, height and depth. In a more simple manner, space is the place we would like to design. It could be our bedroom, the office open floor or our backyard. The way we organize and fill objects in a given space, will affect how we feel in it. Positioning correctly, leaving empty spaces and using the right objects, can significantly improve the overall interior design. .
Not working correctly with small space can eventually create an overload of stimulation and stuffy feeling. Or it to can give you the nice and cozy look. Here are the best practices of working with small spaces. the more open space left, the less stuffy feeling. Leaving Empty spaces gives the feeling the room is larger than it actually is. Take a look at the following examples of right and wrong. The Empty space left create a cozy feeling to the room. Almost no floor space is empty, which create a very stuffy feeling. 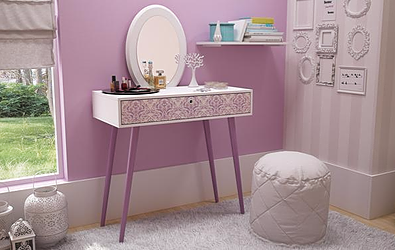 Mirrors create an optical illusion that can make the room look larger than it actually is. 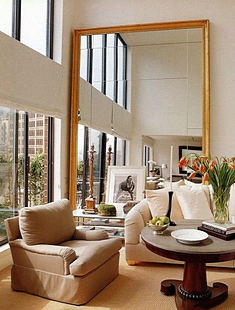 Windows open the space in the room and create visual continuity. Using cool and light colors, like blue, white, cream and etc. can make the feel that the room is larger and have much more open space. Dark colors can create the opposite. 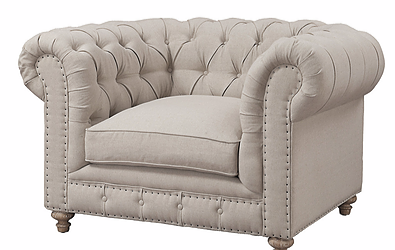 Putting furniture which has space from the floor like a chair with high legs, will allow more open space to the room. Large spaces can have the opposite effect. Wrong positioning of large spaces and choice of objects can create empty look which makes a cold and depressing feeling. On the contrary, leaving a lot an empty space with the right position of objects can create a very trendy and luxurious look, like done in Minimalist design. Here are some best practices when decorating a large space. 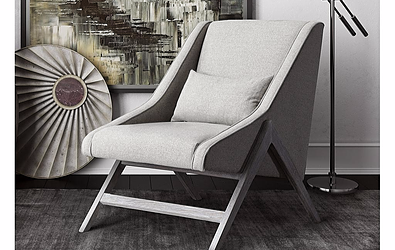 For example using a coffee table or chair with small or no legs is covering a lot of empty space. Divide the space to different activity zones.The idea is that in large spaces can have different sections of activity. 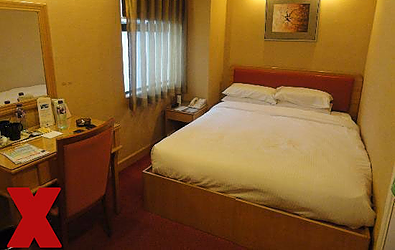 For example, a studio apartment can be divided to a living section and bedroom section. Placing a piece of furniture as a divider is one of the recommended options of dividing the space to few sections. 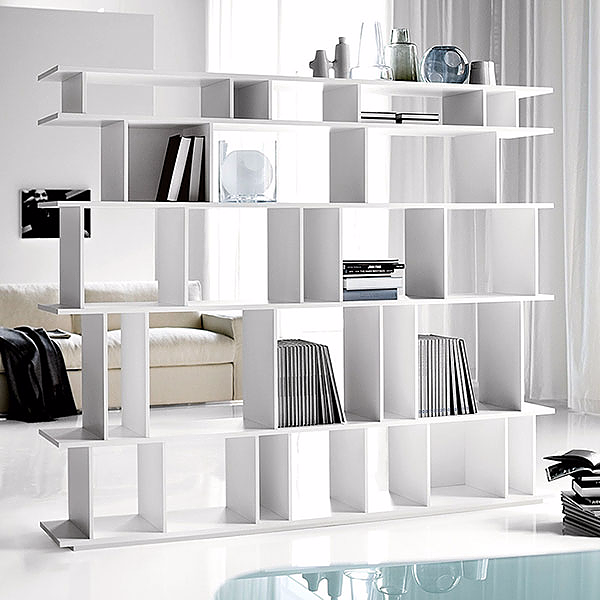 In the example below, a bookcase is used to divide the space into 2 sections. Lines in interior design are given to lead the eye from one point to another, to create a flow of the interior design. Lines are giving the direction and will affect the feeling you get from the room. Thus, the main uses in lines are either to create visual effects in the space (for example, make the room look higher than it actually is) or to convey specific feeling regarding the space you are in. You can create lines in design using wall coverings, furniture and decor. The common lines used in interior design are Vertical, Horizontal and Diagonal lines. Vertical lines usually translated to a look of dignity,formality, stability and strength. They create the feeling of aspiration and ascension. Using vertical lines create a visual effect which space is looking higher than it is. Vertical lines also create the feeling of action in the designed space. In the example below, the wall covering are creating vertical lines in the designed space. Horizontal lines create an effect of peace and harmony. Using horizontal lines make a relaxing cozy feeling. 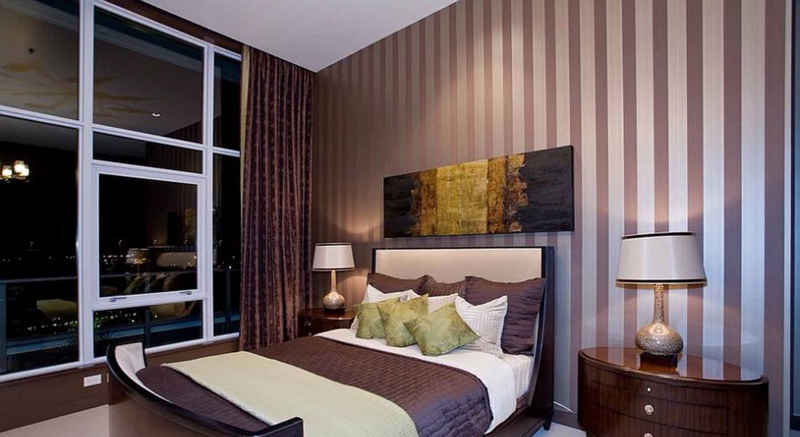 Additional effects of horizontal lines are to create emphasis to a specific object or specific wall in the room. Also, horizontal creating a visual effect that make the space lower buy wider than it actually is. In this example, a ladder shelf is used to create horizontal lines in the room. Diagonal lines are active, they create action and suggest movement from one point to another. Diagonal lines are flexible because their exact direction may vary from shallow to steep angles. Usually diagonal lines refer to moving from place to place, like staircases. Color is the most important element, since it’s effect on design is the most dominant. Color can create a mood, attract attention, or make a statement. Using the correct color scheme can determine whether you would like the room to present elegance, peaceful, formal or playful environment of the space. 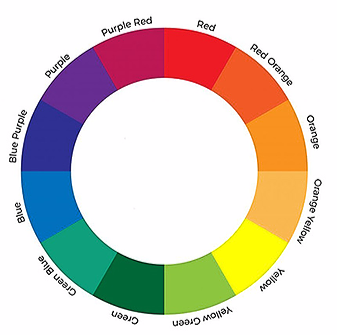 The color wheel is the basic tool we use to set the color scheme of our interior design. It's divided to warm and cold colors, each type creates it’s own effect. Warm colors are considered energetic and usually more dominant. They tend to get more attention. 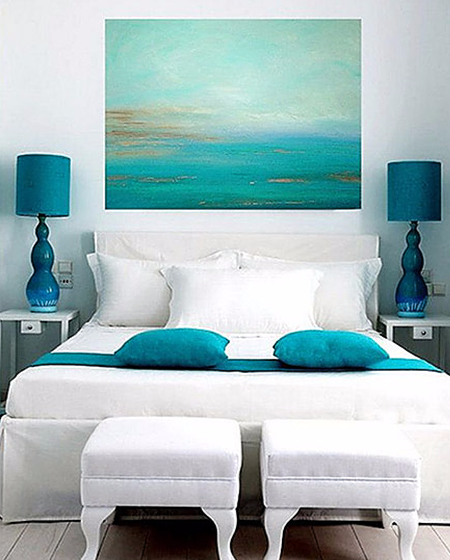 Cold colors are considered more calm and create a relaxing feeling. The color wheel is compound of primary and secondary colors. Each of those colors have their own shades. We use the color wheel in order to understand and decide the color scheme we will be using for the design of our room. Secondary Colors: Orange, Purple (Violet) and Green. 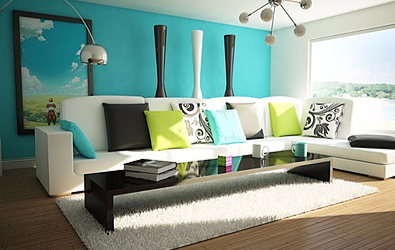 Color scheme is a set/combination of colors that is used while designing your room. Simply put, the color scheme is taking a set of colors from the color wheel, to use it for the interior design of our space. There are a few common schemes that are primarily used in the interior design. Using different shades of a single color. The shades are created by changing the brightness and saturation of the color in different objects. 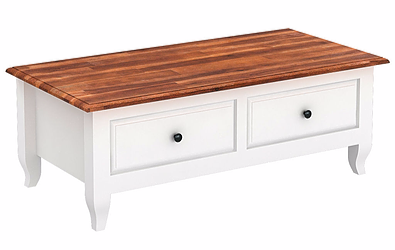 This creates a clean and elegant look. The main color is usually integrated with neutral colors such as black, white, or grey. Monochromatic scheme can also refer to the use of no colors from the color wheel, and using only neutral colors (black, grey and white). A monochromatic scheme using blue as the single color. 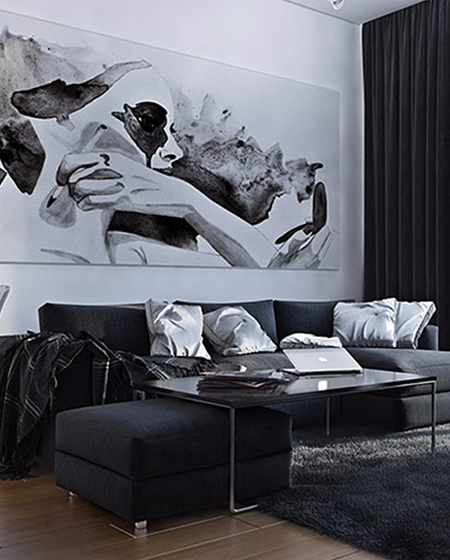 A monochromatic Scheme using only Neutral colors (White, Black an Grey) with all furniture and decor accents. No colors from the color wheel are been used in this design. Use of colors that are next to each other on the color wheel, along with neutral colors (Black, White, Grey). One color is used as a dominant color while other is used to enrich the scheme. The Analogous color scheme usually contains 3 or more colors. This scheme is also often called Harmonious, since it's gives a pleasing and relaxing appearance to the design and feeling of peace and harmony. Analogous scheme using cold colors. Blue and green are the colors next to each other on the color wheel, while black and white are neutral colors. Analogous scheme using warm colors. Orange and Yellow are used from the color wheel and White as a neutral color. The triadic scheme is using 3 colors equally. This scheme creates an effect of strong visual contrast between colors. Usually used to create a more bold and externalized design. The triadic scheme looks very colorful and alive, but in some cases can create overload of stimulation and difficulty to focus the visual weight. This design goes well in game rooms or children bedrooms or if you like the externalized design, this scheme could be the right fit. Triadic Scheme using Orange, Green and Purple. White as the neutral color. Triadic Scheme using Purple Red, Green and Blue. Black and White are the Neutral Colors. This scheme is created using 2 colors which are opposite to each other on the color wheel. Warm VS cold color. When choosing this scheme, usually the warm (more dominant color) is used for accents and to enrich, and the cold color is used as the primary color. This scheme can create a very colorful and strong visual appearance to the room, or it can create a calm and delicate appearance by using the color scheme on very specific objects.The example below shows how to make a delicate use of this scheme, where the lamps and small decor accents are in orange and the bar chairs are in blue. To those who are afraid using the complementary color scheme because the colors combination is too minor or the appearance will be too flashy, the split complementary scheme will be a good fit. This is a variation of the standard complementary scheme. It uses a color and the two colors adjacent to its complementary. This provides high contrast without the strong tension of the complementary scheme. The common use of the scheme is by taking one dominant color, and the 2 other colors are to enrich and emphasize. Split Complementary scheme using Blue as the main color and red and green as the enrichment colors. Split Complementary scheme with a more delicate manner. Yellow as the main color and purple and blue as the enrichment colors. YELLOW - Comfort, Summer, Optimism. GREEN - Well-being, Nature, Calm, Harmony. BLUE - Peace, Depth, Stability, Relaxing. PURPLE - Royalty, Luxury, Elegance. GREY - Intelligence, Serious, Traditional. BLACK - Elegance, Formality, Strength. WHITE - Purity, Peace, Simplicity, Newness. Adobe Color CC - with this app you can create and check different color schemes with different colors in seconds. It allows you to get the exact color shade for the combination you want. You can also upload a photo of a design that you like and the app will extract the color scheme of this design. Coolors.co - This app can also let you generate different color schemes with an iOS app. EasyRGB - This service searches the color title for real brand wall paints, using the RGB color. Once entering the RGB it searches all the known paint brands and department stores and find the shades that are closest to the color you desire.